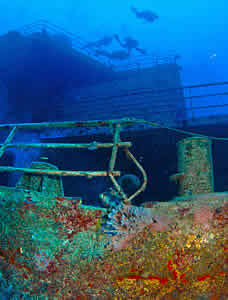 KEY WEST, Florida -- It took less than two minutes for the Gen. Hoyt S. Vandenberg to reach the ocean bottom off Key West May 27, 2009, yet within a year it has bloomed into a timeless circle of life in the Florida Keys National Marine Sanctuary. Project organizer Joe Weatherby said the Vandenberg is exceeding all expectations since it became the world's second-largest vessel ever purposely sunk to become an artificial reef. "We have giant schools of fish, there's all kinds of invertebrate life covering the ship, and great big bait balls show up to the point where you can't even see the ship through the fish sometimes," Weatherby said. "It's like a big party going on." Keys dive operators agree. Captain Lauren Brancel, a divemaster with Key West's Lost Reef Adventures, said sea life has exploded with thousands of arrow crabs "bigger than your hand" scouring the ship's surface and stairwells, while about 75 large barracuda patrol the wreck. "A huge goliath grouper has parked itself on the bow, and a green moray eel lives in one of the cubbyholes mid-ship near an elevator shaft," Brancel said. The Vandy's steps, railings and superstructure are glazed over with Gorgonian corals, sponges and sea urchins eating algae as quickly as it grows. Eric Schaaf, manager of Southpoint Divers, said any growth on the wreck adds to the habitat, and divers who spend their time looking for the little things will see a lot more. "There are tons of algae and coral growths, and when we see blennies, shrimp, tiny lobsters, fish eggs, sponges, feather dusters and tube worms, they all add to the wreck's life," Schaaf said. "It is definitely growing into an incredible dive." Brancel added that the giant bait balls seen this time of year � clouds of blue runners and round scad that attract schools of snapper, jacks and barracuda � fill the entire wheelhouse. Lad Akins of the Reef Environmental Education Foundation, an organization spearheading a multiyear fish population study at the Vandenberg site, confirmed 113 species of fish have been documented. Dive Key West owner Bob Holston said his revenues have increased 18 percent compared to the same time period a year before the Vandenberg was sunk. "We're having our best year ever, in 40 years of business," Holston said. "We have had groups call from as far away as Brazil and Europe to come dive the wreck, and 80 percent of our phone calls are to answer questions about the Vandenberg." Cece Roycraft, who chairs the Florida Keys tourism council's dive advisory board, said that her polling of Key West dive shops indicated about 15,000 divers have descended on the Vandenberg via chartered dive boats since it was scuttled. She estimated at least another 7,000 divers have submerged from recreational boats. The ship first saw duty as a U.S. Army troop transport named the Gen. Harry Taylor. It became the Gen. Hoyt S. Vandenberg in 1963 and tracked the U.S. space program's launches off Cape Canaveral. It also served in the Pacific monitoring U.S. defense missile test launches and eavesdropped on Russian missile launches during the Cold War. Port Canaveral, Fla., was the Vandenberg's last active duty homeport beginning in 1976. The Vandenberg was retired in 1983 and 10 years later was formally struck from the naval register and transferred to the U.S. Maritime Administration. The ship received its most public exposure when cast as a Russian science ship in "Virus," a 1999 motion picture starring Jamie Lee Curtis, William Baldwin and Donald Sutherland. 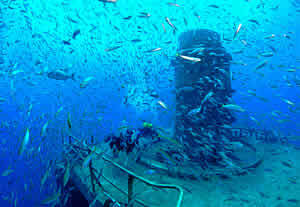 The Vandenberg represents the southernmost part of the Florida Keys Shipwreck Trail, a series of intentionally sunk vessels that begins off Key Largo with the former Navy landing ship dock Spiegel Grove.